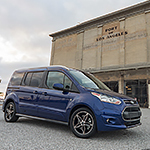 2019 Ford Transit Connect - The Van You Can Tailor To Your Needs | Randy Wise Ford Inc. Whether you need a cargo van, a contractor van, or a van to accommodate your growing family or organization, the Ford Transit Connect can be customized to your specific needs. The long wheelbase model has over 120 cubic feet of rear storage, expandable to over 145 cubic feet with the passenger seat folded down, and a maximum payload rating of 1,570 lbs., making it ideal for moving merchandise, supplies, tools, or even people. The short wheelbase package is highly maneuverable in traffic and can easily squeeze into tight parking spaces. It offers 104.8 cubic feet of cargo space, which expands to 123.2 cubic feet with the passenger seat folded down, and a payload rating of just over 1,500 lbs. When folded down, the passenger seat can be used as a desk for paperwork. Set the passenger seat in the upright position and your organization can choose between three different passenger configurations. The short wheelbase seats 8. The long wheelbase seats 12, and the extended-length passenger van can seat up to 15 adults.